Who’s Been Stealing My Compost? I try to be a responsible Earthling. I reuse and recycle as much as possible. I count on my compost to replenish the soil in my gardens. It’s one of my three dirty secrets. So I do not take kindly to some critter helping itself to my stash of organic trash. 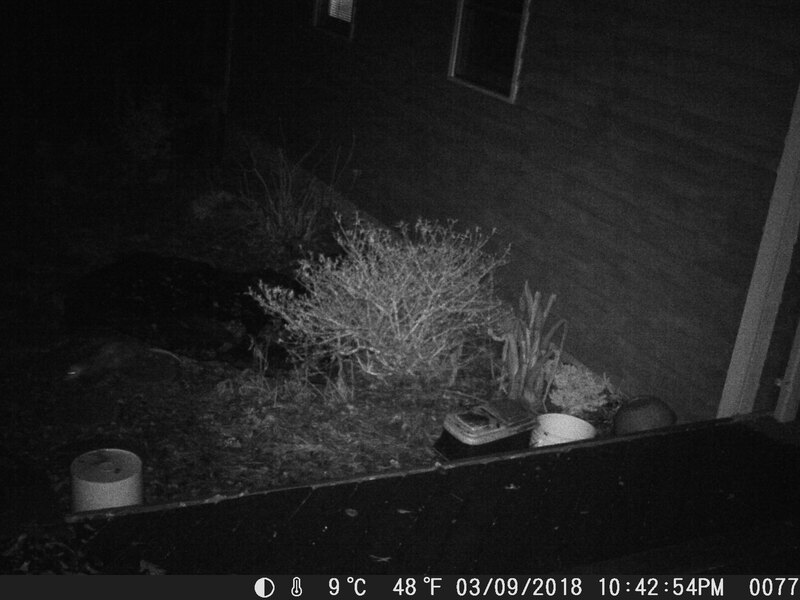 This has happened twice recently, so I set up the critter camera to catch the culprit. The sneaky stealer is to the left behind the white bucket. I had so hoped for a raccoon! They are much more interesting. This is the time of year when I do a lot of digging. I have to bring in all me tender plants that will not survive the winter outside. So when these plants are dug up and brought in, there are empty holes. This is the perfect time to amend the soil for next year’s planting. I start out by throwing in a few shovel fulls of nasty compost. This gets chopped up and mixed with some of the removed soil. Then I top this off with some seasoned bunny litter. Then the hole gets filled in with the remaining original soil. There is a science to this messiness. My compost is never seasoned enough nor balanced before going into the ground. and mix it with soil to get the bacteria in good contact. Never put unseasoned compost near a plant. It needs to decompose. that would love to dig up the slimy fruits and veggies for a nasty feast. Come next spring, the soil in these holes will be fertile and full of worms. This is my dirty way of preparing for spring as everything dies. I shouldn’t share these. They are the secrets of my success. But my devoted readers deserve to know the truth. I do three rather gross things that make my gardens lush. Be prepared, they are nasty and stinky. If you are squeamish, you may want to stop reading about now. My FIRST dirty secret is compost. Not the nice leafy kind mixed with leaves and grass clippings. The gooey, juicy kind that stinks. All veggie and fruit scraps along with egg shells and some coffee go into a five gallon bucket with a tight, screw-on lid. If you don’t keep the lid closed tightly, raccoons come to snack. Also the compost gets full of maggots. That is really gross. Then I add the stinky soup mix and chop it well with my shovel to mix it with the soil microbes. Cover this trench well with dirt or the critters smell it and dig it up. This stinks enough without adding a skunk spray in the mix. My SECOND secret is used bunny litter enhanced with pee and poop. I use paper pellet litter. This is seasoned in buckets until moldy. I have two adorable, fuzzy compost factories. Food goes in one end, fertilizer comes out the other. This seasoned concoction gets raked and mixed with the soil, then covered with mulch. Everything loves this top dressing. It holds moisture and decomposes to release nutrients. My THIRD secret is a recipe from fellow blogger, John Viccellio. He got it from a plant grower. It’s in his excellent e-book, Guess What’s in My Garden. It contains Miracle Grow, Fish Emulsion, Epsom Salt and Liquid Iron. I mix up a concentrated version of this recipe and store it in big plastic bottles with screw top lids. I dilute it right before I use it. His recipe makes over 6 gallons of concentrate, so I basically halve it and make three gallons. This 1/2 batch has lasted me three seasons. It brings back even the most struggling plants. Liquid gold! Even when diluted, the mixture REALLY stinks, so DO NOT use it inside on your houseplants. Okay folks. Now you know my secrets. I hope you still respect me. Gross waste produces lush gardens. WIN:WIN!